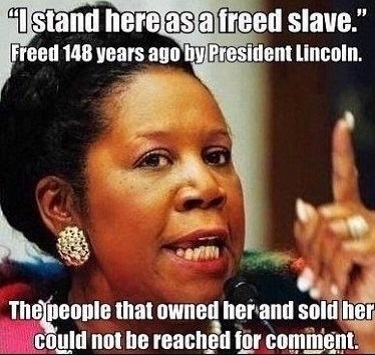 Enslavement is Peculiar circumstance in it's self, the true slavery of humans being bought and sold like the Southern Democrats wanted to keep in the Civil War. And those that volunteer to be enslaved, even vote for it, in respect to the latter statement I suspect far more volunteer, than are bought and sold. 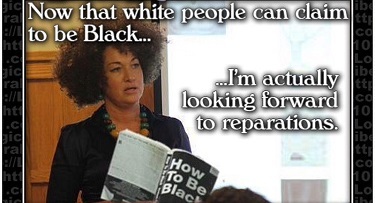 And knows no skin color. This is the same UN that Barry and Hitlerly, want the US to turn our Sovereignty over to. 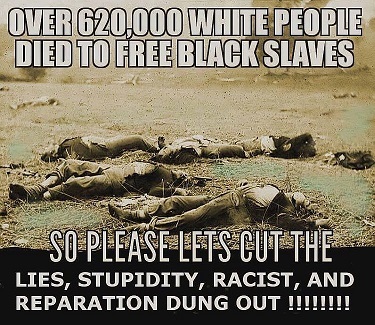 Some things over-looked, there is NOT one current country in this world that has not been touched by slavery in their, lets say 1000 year histories. And a lot going on currently in the black nations of Africa where they are actively participating in the enslavement and genocide of their own people. Ah , but that's not the point is it? American's must be punished, preferably White ones , how this Not racial profiling is beyond me. I have to watch, black communities destroy and enslave themselves, because they are encouraged and told they are entitled to. WE ARE MUCH EASIER TO CONQUER IF WE ARE SEPARATE. Although slavery, as practiced in the US continued into the 1860s, I'm wondering that, since it started well before the US became a country, does that mean that this commission will be going after England, Spain, Portugal, Holland and France? Or, is this a deep-pockets only thing? 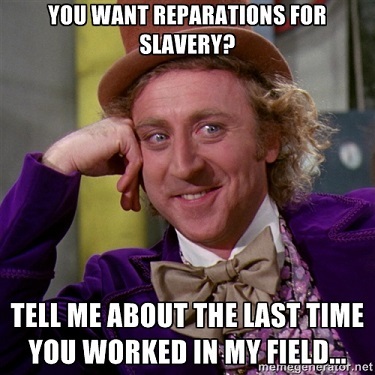 Also, since many slaves were initially put into the system by blacks in Africa, (captured, held, and sold) will there be any thought of capturing reparations from the West African countries who engaged in these practices......???? 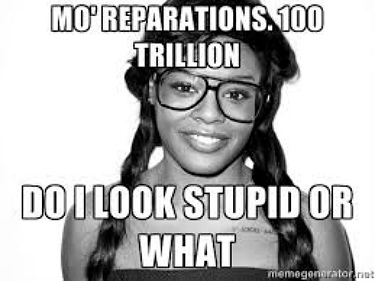 Would You Believe... A Harper's Magazine estimate in 2000 put the total due as reparations to African Americans at over 100 trillion dollars?! Last edited by Riddick on 09-29-2016 10:53 AM, edited 1 time in total. Riddick wrote: Would You Believe... A Harper's Magazine estimate in 2001 put the total due as reparations to African Americans at over 100 trillion dollars?! Would you believe the figure is based on 222,505,049 hours of forced labor between 1619 and 1865, with a compounded interest of 6%? Where they'll get the other 60 trillion, who knows - A global tax on pale pigmented people of European descent, mebbe? Kbot, My take is a little different. One, I don't believe the Saudi's turned those buildings into "Dust", the technology to turn metal into" Dust" is just not there. At any rate, I don't have any trouble with some "Odd Ball" justice, for all other atrocities they do, and there are a lot of them! Their kind of Diplomacy we don't need. Obama does, and he will really miss Kissing their Butts, to keep the terrorists going. See below! Is this gonna be the sort of slavery where the masters are kind enough to accommodate the poor toiling sods with only sufficient food, clothes, shelter and basic health care to survive? Or will it be folks don't even get that much, even as lashing is delivered to assure we're all working to death? Probably too much to even hope it's the former.... It IS Hillary we're talking about, donchaknow! Doka wrote: Kbot, My take is a little different. One, I don't believe the Saudi's turned those buildings into "Dust", the technology to turn metal into" Dust" is just not there. At any rate, I don't have any trouble with some "Odd Ball" justice, for all other atrocities they do, and there are a lot of them! Their kind of Diplomacy we don't need. Obama does, and he will really miss Kissing their Butts, to keep the terrorists going. See below! Hasn't our government already labeled some countries as being such? Is Obama that much out of touch with reality???? Riddick wrote: Would you believe the figure is based on 222,505,049 hours of forced labor between 1619 and 1865, with a compounded interest of 6%? 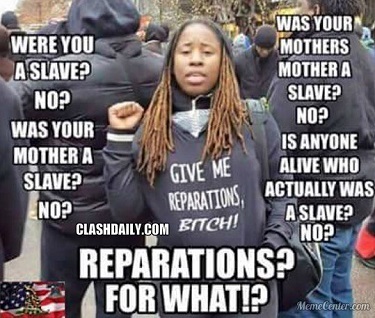 So, to summarize, the US is to pay reparations to descendants of people who have already received compensation as well as top people who are not descendants of slaves, arriving in the post Civil War years, AND continue to support, prop-up or otherwise shovel money at countries around the globe that want to shut us down.......... Sounds like the perfect opportunity to pull all US aid to foreign countries, shut down the UN building in New York and stop payments to the UN, kick the whole kit'n'caboodle back to Geneva to the sinkhole they crawled out of and start taking care of people here at home by reinvesting in the economy here and hiring the descendants of slaves to good-paying, long-term jobs with healthcare benefits, improving their neighborhoods, providing better schools in their neighborhoods and getting them off the streets. The pay back was in the North's blood from every soldier wounded or dead in Abe Lincoln's NEW CAUSE to defeat slavery and win at all costs lead forward without flinching by U.S. Grant. They won it to a close at Appomattox, Virginia and over 100,000 blacks fought for their own freedom in which the movie "Glory" finally brought to light! I would not be against dedicating one US Mint for printing money for this reparation. Have one hundred semi trucks pulling dry vans on stand-by in the parking lot, let's say out West in Denver? The ways D.C. looses green backs with no accountability would show this generosity to be a better use of dyed paper and cloth from at least one US Mint! New York City needs a giant thrift store, not necessarily a Wal-mart, and OUR UN Building would suffice nicely! kbot writes: "Sounds like the perfect opportunity to pull all US aid to foreign countries, shut down the UN building in New York and stop payments to the UN, kick the whole kit'n'caboodle back to Geneva to the sinkhole they crawled out of......"
Off topic, but wait If we EVER boot them out of NYC looks like they'll have control of the Internet well before they arrive in Switzerland! Maybe as soon as one more day kbot! It's not so much in the news you'll see or hear today. The total insanity out of Oh bummer's D C in no way makes the liberals blink twice or roll their eyes! This is an edit not noted below: Here's news of UN's odd inheritance of OUR Internet from this very strange US Administration's planned hand over any day now????? Let's hope logic rules in Washington D.C. again soon. Fresh from Robert Spencer today..........October 1, 2016! Aw oh! It happened Saturday, today yet with 7 mins left til tomorrow. But today's date is wrong every day it's one day ahead at FF! This ain't to laugh about but let's see what happens when the new non profit Net controllers plan their money route! What if each e-mail or text auto charges the sender a small fee per send off to help cover the U$ Postal $ervice's losses? The changes to the Internet norm maybe endless losses of liberties once cherished and seldom challenged under free speech.